Not seeming to understand the relationship of cause and effect, former Al Davis mandated pick Michael Huff is whispered to be cut, possibly as soon as training camp. Huff, a "Davis Special," ran a 4.34 at the Combine, which prompted Crazy Al to ignore all his scouts and make him the number 7 pick in the draft. And like many A Davis mandated picks—despite the blazing speed that Al covets—the pick does not pan out. Just a reminder, Davis picked Darrius Heyward-Bey, who ran a 4.3 at this year's combine, and Davis picked him with this year's number 7 pick (over everybody's thought that Heyward-Bey was a late first round pick at best), so I guess you can expect Heyward-Bey to be cut ignominiously in about 3 years. Professional malcontent and occasional ballplayer, Gary Sheffield says he wants to play two more years, and he wants them to be in Tampa Bay, where he owns a home. Please tell me if you can think of one reason why the Tampa Rays would sign Mr. SurlyPants. He's a detriment in the outfield and they already have a big-money DH in Pat Burrell. Sure, the Rays might need some slugging, but Sheffield can't even provide that much anymore. Missed this article when it first came out, but better late than never. Anyway, finally, Fox Sports and MLB have decided to move World Series games up one half hour, so that now, first pitch will be at 7.57. Selig acknowledges there's been "carping, mostly in the East Coast time zone" that playoff games have started too late for kids — especially on school nights.. "There's certainly a belief that for a younger audience, particularly on the East Coast, this is a real plus. Can this help the ratings overall? You never really know." Heck forget school kids. I fall asleep sometimes with how long some of these games last. This is a good move by MLB. Interesting tidbit in the New York Times "Fifth Down" Blog. In it, they use statistics from the past season, and man by man, rate the Jets and Giants offensive lines. And much to their surprise, they stats showed that the Jets have the best O-Line in New York. Check out the rationale and see if you agree. Class move by the Yankees asking the Bleacher Creatures to move down to the seats just behind the dugouts during last week's 5 1/2 HR rain delay. 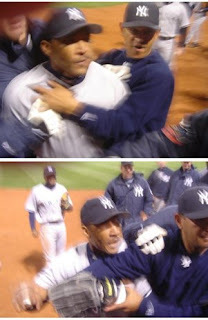 For an organization that gets blasted as the "Evil Empire," they do sometimes show a class touch with their fans. In one of the sickest and saddest story, former big leaguer Mel Hall was convicted by a jury in less than 90 minutes, of sexual assault. Now if that isn't bad enough, the story goes that the parents of one of the girls Hall molested, basically sold her for cash and prizes. Hall bought the parents cars and gave them cash, and they let him sleep with her underage daughter. Hall rightfully deserves to be sent to prison, but what about the parents. Where's their trial? To get that taste out of your mouth, here's a good story. Former NFL bust, Wendell Bryant, who battled with the bottle for years and is now clean and sober, has gotten a second chance and was drafted by the United Football League. Good luck, Wendell and hope nothing but the best for you. Interesting scoop by Buster Olney. He writes that Huston Street has moved from one side of the rubber to the other, and since he has, Street has posted a 2.33 ERA and has converted 15 of 16 chances. Not coincidentally, the Rockies have won 15 of their last 16 games and are now percentage points out of the Wild Card spot. This of course, raises the dilemma; Do the Rockies keep Street, or try to trade him for big time prospects? By the way, nice throw, Melky in the 7th inning last night. I know you're still young, only 24, but you've been in the bigs for almost 500 games now. You gotta stop with the bonehead plays. You basically cost the Yankees the game. 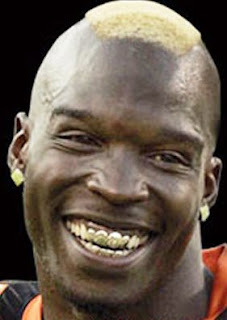 And finally, in the bizarre story of the week....Carson Palmer's wife banned Chad Ochocinco from her house. See, it seems Chad has invited himself into the Palmer's house this summer, in order to "work out" with Chad. Or whatever. Anyway, Palmer's wife, Shaelyn was having none of it. However, Mr. Ochocinco is still insisting that he is going to stay with the Palmers. That's after he beats up Mike Golic, apparently. "Professional malcontent and occasional ballplayer, Gary Sheffield says he wants to play two more years, and he wants them to be in Tampa Bay, where he owns a home." In all my years as a hater of Sheffield the person and lover of Sheffield the ballplayer, I have never heard a better description of the guy. And his own comments dually sum up his arrogance. Thanks Eric for the compliment. I'm actually not a huge fan of Sheff the plaer either. Don't know how many times on a single, he tried to throw a guy out from right field when it was obvious the guy was going to be safe, thereby allowing the hitter to get to second base. Never once learned. But man Paul. He could sure freaking hit. No doubt the man could crush. But there's a reason this 500+ HR hitter has been on 8 teams over his career. Ahhhh, don't listen to me. i have an irrational hatred for the man.